A solar eclipse is a phenomenon caused by the interposition of the Moon between the Sun and the Earth, dimming the sun light either entirely or partially. Eclipses are more common than you might think, but at a particular site on Earth, you can see a total solar eclipse only once every 360 years. Why does a solar eclipse occur? As you know, the moon, Earth and other planets and satellites spin around their axis and at the same time orbit around the Sun. The duration of the orbits varies according to the distance from the sun, so at different times of the year, the planets are in different positions. Solar eclipses occur only if the moon is in the new moon phase. When the moon is in the new moon phase, it is orbiting very close to the Sun from a perspective seen from Earth, and that is when a solar eclipse can happen. Strictly speaking, solar eclipses occur only if the moon is in the new moon phase, but this obviously does not mean that they can happen every month. Sun and moon eclipses would occur every month only if the moon rotated in the same plane in which the Earth does around the Sun, called the ecliptic plane. Another important issue is that the moon is at a distance from earth that is similar in size to the sun, so it can perfectly cover the sun when it passes in front of it in the case of total eclipses. Each year there are between 2 and five eclipses, and every 100 years occur about 240. On average, a total solar eclipse occurs every 18 months and lasts no more than a few seconds or minutes. Each year there are between 2 and five eclipses, and every 100 years occur about 240. However, there are no more than two total eclipses every year. In a solar eclipse, the umbra is the shadow projected on the Earth and produced by the moon when it completely blocks the light from the Sun; therefore the people on such area see a total eclipse. In contrast, a softer shadow product of a partially covered sun is the penumbra; evidently, people that experience the penumbra see a partial eclipse. What are the types of solar eclipses? It is only visible from a small area of ​​the Earth where the moon completely covers the Sun. People in the center of the moon’s shadow are the ones who can see a total solar eclipse since the umbra passes in that area of ​​the earth’s surface. 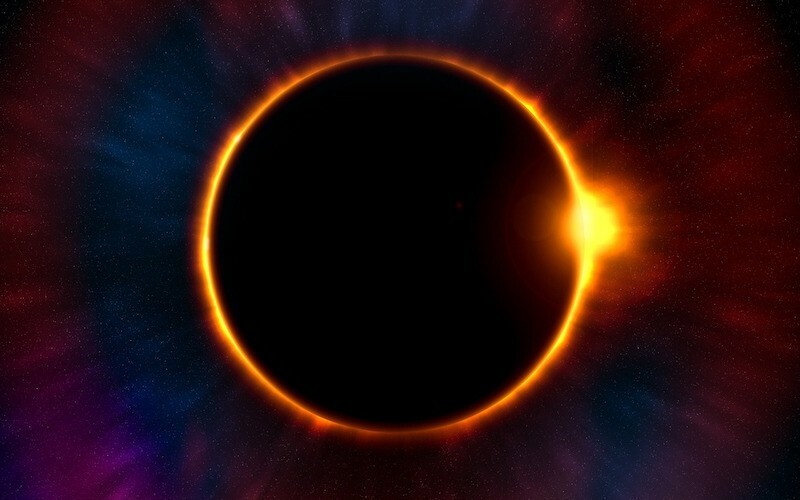 During this type of eclipse, you can observe the chromosphere, which is the outermost zone of the Sun, along with the solar corona and other protrusions. This kind of phenomenon happens when it is only possible to observe a small section of light in the form of a ring from the disk of the Sun since the Sun and the Moon are aligned, but the size of the latter is smaller than the apparent dimension of the Sun seen from the Earth. 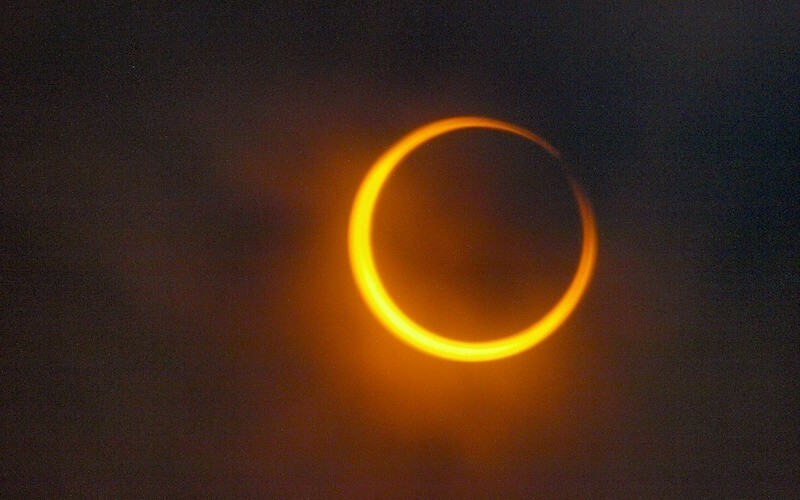 In this type of eclipse, only a part of the Sun’s disk is visible, so the crown and the chromosphere can not be seen. The shadow of the Moon passes through an area of ​​the earth’s surface, and it is called the penumbra; therefore, a person located in this area observes a partial eclipse. A hybrid eclipse is the fourth type, but it is very unusual. It happens when the eclipse is total in some regions of the terrestrial surface, while in others it is seen like annular eclipse. IMPORTANT! You should not observe the solar eclipse directly with your eyes; A special filter must be used to protect your eyes. Otherwise, you risk damaging your retina irreversible to the point of losing your sight. Despite not affecting humans, solar eclipses were associated with bad omens and mythological events by some ancient cultures. For example, the Vikings believed that during eclipses wolves pursued the sun or the moon and managed to catch them. This belief of beings who ate the sun or the moon was common in many ancient cultures so that people used to bang objects hard enough to make a sharp noise that would frighten the evil creature. One of the myths that still survive in some parts of the world is that these eclipses can be dangerous for pregnant women and their unborn children, but this belief has no scientific basis. However, it is important to remark that you should not watch the solar eclipse directly with your eyes without a proper filter to avoid eye damage.